Eight listening devices were found in the automaker’s meeting rooms on July 11 following a search of its building by federal agents. Three weeks earlier, a search warrant was served on the residence of former engineer, Sharon Leach, in Wyandotte. Several Sansa listening devices like this one seen here were found inside of Ford Motor Co.’s meeting rooms after a search by federal agents on July 11. A former Ford Motor Company engineer is being investigated by the FBI after listening devices were found in meeting rooms at company offices, the automaker said on Friday. The Federal Bureau of Investigation served a search warrant at Ford offices on July 11, the company cooperated, and agents left with eight listening devices, an FBI spokesman said. 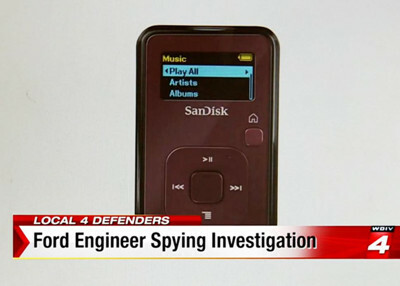 Documents filed with the U.S. District Court for Eastern Michigan showing what was seized by the FBI at Ford and at the engineer’s residence show that eight Sansa recording devices were taken from Ford offices. Three weeks earlier, the FBI served a warrant on the residence of the engineer, Sharon Leach, in Wyandotte in suburban Detroit, court records show. Three weeks before the search which turned up recording devices items, the FBI served a warrant on the residence of former Ford engineer, Sharon Leach, in Wyandotte in suburban Detroit, court records show. Seized from the residence, according to documents filed by the FBI with the district court, were four laptop computers and a desktop computer, along with three USB drives, financial records, some documents from Leach’s employer and one T-Mobile Google telephone. A third warrant was served to Google Inc, asking for records of Leach’s email account including emails sent to and from her account as well as drafts of emails and deleted information associated with the email account but still available to Google, according to court documents. Google supplied several items, including a video disk marked as a reply to the search warrant and a cover letter, according to court documents. Google sent the items by overnight delivery on Wednesday, court documents show. However, the court documents did not show the contents of the disk or other information supplied by Google. Eight listening devices were found in Ford Motor Co.’s meeting rooms on July 11 following a search of the Detroit automaker’s building. Seen is the automaker’s headquarters in Dearborn, Mich.
“Ford initiated an investigation of a now former employee and requested the assistance of the FBI,” Ford spokeswoman Krusel said. The Detroit News, which first reported the investigation early Friday, said Leach worked for Ford for 17 years and was a mechanical engineer. No charges have been filed against Leach, 43, the paper said. Calls to Leach’s attorney, Marshall Tauber, were not returned on Friday. Leach placed the devices under tables in meeting rooms to enable her to transcribe what was said for her own use and did not intend to share the recordings with anyone, the newspaper cited Tauber as saying. The devices were not installed in rooms where the company’s board of directors would meet, the report said.